I considered it a "stoplight book." One that you are tempted to read at any red light while you waited for it to turn green. Are you going to post reviews of your favorite books that you listed to the left? I will definitely post reviews for my favorite books! Thanks for reminding me where to start! I may have to sneak in a new one I just read though because I'm reading something really good right now! It took Suzy several months to finally convince me to read this book. First it's over 900 pages! Unless you count trilogies I'd never read a book that long. Second, it takes place in Medieval times something I thought I had no interest in outside of Monty Python movies. But I really loved this book. The writing is outstanding. 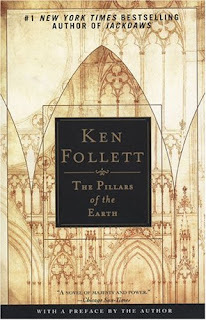 Ken Follett (Eye of The Needle) creates a world which spans generations. The characters become people you care about and in some cases despise. I also found the politics of those times to be quite fascinating. How a King dying without an heir can effect the lives of peasants who are now at the mercy of local Earls while the the parties claiming the throne have no motive to reel in their abuses. The power the Church shared with the ruling class and how that power could be used and abused. And the course fate plays in people's lives no matter how carefully their plans are made and executed. A great book, I highly recommend it. And I would like to thank Suzanne for pestering me to read it. Dare I say it? She was right! If you want to find out what happens to the descendants of the characters that you have grown to care about you have to read World Without End. It takes place in the same town of Kingsbridge about 2 centuries after the cathedral has been completed. There is a new cast of wonderfully interesting characters who once again face the familiar obstacles of life. Love, greed and power shape their lives. It is a story that stands on it's own but I enjoyed the references to the characters that I had known from Pillars of the Earth. It's another long read but worth the time. I can't believe you had time to read this too! Did you start it right after Pillars? I've already bought the book (Kindle version,much lighter)just haven't cracked it open yet. I read them several years apart and wish that I could have read them back to back. I had to go back and review the characters.